air delivery design reduces bottoming out. The air bladder is enclosed and protected to prevent the air chambers from being punctured. The Airform® pad captures and provides a continuous smooth interface with the surface anatomy. 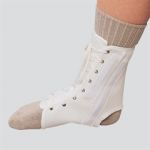 This is a medium duty, controlled stretch ankle support that allows full range of motion. It provides compression where it is needed most  over the soft tissues of the joint  without binding or cutting around the edges. It increases wearer confidence for walking or standing.